Four kids, a mini-van and a lot of love: A big THANKS! We got a bunch of baby toys/things from my best friend Jess, since they are done having kids. A pack n' play, a swing, an exersaucer, a bouncer, and a Boppy. A lot of things are doubles of what I have, but it will be great for the daycare. Thank you so much Jess! I really appreciate it!! 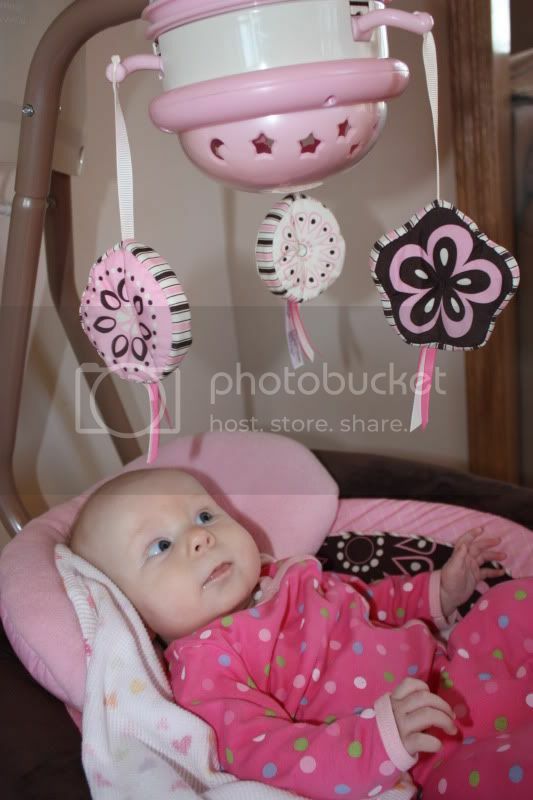 She is so cute in that swing! Swings are THE BEST! My kids loved theirs. :) That looks like a beautiful one too! That was nice of her! I gave all of my baby stuff to one of my friends too. She is getting so big! Good luck with your daycare. It can be tough right now with the economy but I think you are in a much larger area than I am. Best of all its great to be home with your own kids!